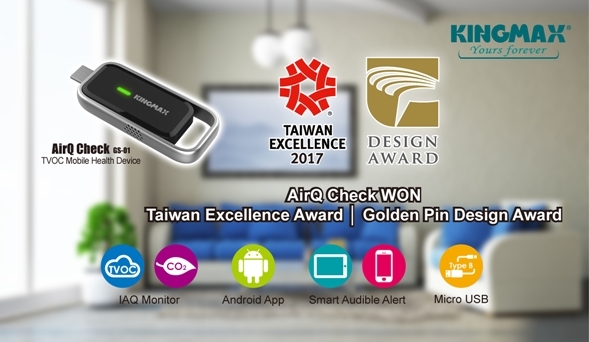 Memory Manufacturer KINGMAX reports that its trailblazing AirQ Check TVOC Air Quality Monitor Device has won the 2017 Taiwan Excellence Award again, after the Golden Pin Design Award. Over the years, KINGMAX has garnered 24 Taiwan Excellence Awards for innovative products in recognition of its product development, quality, marketing, and design. After a rigorous review process, KINGMAX’s recently launched smart AirQ Check won 2017 Taiwan Excellence Award again, as the one of most integrated and innovative product in a field of 1188 entries, and as a proud representative of Taiwan’s industry. This year's award-winning AirQ Check TVOC Air Quality Monitor Device is designed for everyone. Its main feature is the detection of the concentration of total volatile organic compounds (TVOC). Within 30 seconds, it can easily detect any gas-emitting products in your environment. More discerning than the human nose, AirQ Check identifies and numerically presents the concentration of hazardous gases from products which you may then decide to replace. In addition, at only 10.5 grams, the AirQ Check is light and easy to carry. It doesn’t need charging, it needs to be plugged in to play. Through the exclusive App you can now know gas concentrations around you anytime anywhere, to easily protect yourself and enjoy a healthy natural life! Next, KINGMAX will launch its new Alcohol Check device(smart breathalyzer) with a built-in gas sensor and powerful firmware that allows you to check the concentration of alcohol in your body and avoid drinking too much!